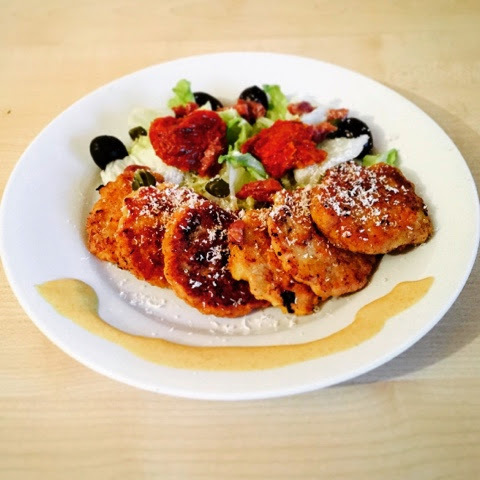 Thai Șnițel (Shnitzel) Salad – Food Art with Team Moldovan! What type of Salad is this? I mean what even is a Shneeeetzel?! Well, this my friends, is a Team Moldovan effort, to make something super healthy, eye pleasing and be tasty all at the same time! Well I think this is one of the recipes that have cracked it, and is now on our list of fave quick & easy lunch/dinner fixes. Salad ingredients (whatever you would like!).. here in this salad we’ve put sundried tomatoes, capers, olives, lettuce, small amount of Parmesan cheese grated on top for decoration. Mix in the minced chicken, with the fish sauce and oyster sauce, mix in well by hand. Take small handfuls of the mince mixture and make them into small patty shapes, dip into the egg, coat both sides, dip into the breadcrumbs, cost both sides, then dip it back into the egg (again, coat both sides) to hold it all together. Next, a small amount of oil on a non stick pan, and place the patties in the pan on a medium fire to cook through, using tongs to turn them over until they’re cooked fully through. You can then team them up with some salad for a light and refreshing meal, I think they taste absolutely great, and are so satisfying to the palette. Also it has to be said, the Thai patties were created by me, however, they look so much cooler on the plate due to my husband’s love of food art and making food look great for serving! (Yes, as well as him being a great cook, he loves to make it look good too, I am a lucky girl!) it was him that arranged it to look super nice before I ate it, so thank you husband you’re the best and I love your food art if you’re reading this! ← 21 Day Cardio Challenge- Mommy Version!